The Great Debate introduces public forum debate, a recent addition to the competitive debate landscape. Unlike many other debate styles, public forum debate that does not require special debate vocabulary or knowledge of detailed theory from either participants or judges. Public forum debate focuses on developing debaters who can persuade any audience to support a particular position through a series of short back and forth speeches which mimic the real world debates on television between pundits and politicians. 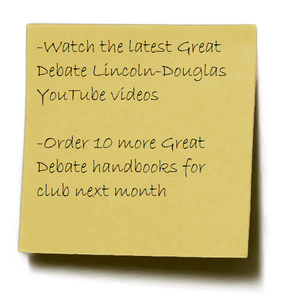 The Great Debate equips students to begin competing in this highly relevant debate format. The Great Debate was written by competitors for their fellow competitors. Covering the basics of debate with special care to explain everything to those with no prior debate experience or knowledge. Advancing to intermediate theory and strategy debaters can use as they develop their skills. This book is perfect for your club, a beginning debate class, or as a reference resource for experienced debaters.